August 8 marks the 30th anniversary of the police’s violent assault on the interracial MOVE commune in Philadelphia’s Powelton Village neighborhood. For some 30 years, MOVE members have been in prison for the “crime” of surviving the police attack. Seven of the eight surviving MOVE prisoners were denied parole earlier this year. A massive police offensive against MOVE, a radical back-to-nature group that proclaimed its right of armed self-defense, had started in May 1977, with 15 months of round-the-clock surveillance. In March 1978, police launched a full-scale siege, sealing off a four-block area with eight-foot-high fences and cutting off gas and water lines to MOVE’s house. At 6 a.m. on that August day, an army of 600 cops surrounded the house to evict its defenseless residents. After bringing in a bulldozer to rip down a stockade fence around the house and using a crane as a battering ram to break down boarded windows, the cops used smoke bombs and “deluge guns” to drive out MOVE members and their children. After a single gunshot was heard, the police blasted thousands of rounds of ammunition into the home. The cops’ fusillade was so intense that one of their officers, James Ramp, was killed in their own cross fire. Though cops claimed the original gunshot came from the MOVE house, witnesses, including a reporter for KYW radio, identified the gunfire as coming from a building behind the police lines. When the adults emerged from the gunfire, police publicly beat, dragged, kicked and stomped nearly to death a shirtless Delbert Africa. The outrage sparked by Delbert’s savage beating, captured by news cameras and televised in slow motion, ultimately led to a federal civil rights lawsuit and indictments against three of the cops. When chilling photos of the beating appeared in the Philadelphia Inquirer, 400 cops picketed the newspaper. After the assault, the police completely bulldozed the house, destroying evidence of their own wrongdoing and proving that the MOVE members’ only “crime” was to survive. The Philadelphia in which the MOVE organization emerged in 1972 was a racist hellhole lorded over by a force of killer cops led by Frank Rizzo, first as deputy police commissioner, then commissioner and later mayor. Any expression of black dissent was met with brutal police repression, centrally meted out by Philadelphia’s notorious “red squad”—the Civil Affairs unit—and the “Stakeout” squad, an urban death squad of police sharpshooters. For the cops, arbitrary stops, beatings and arrests of MOVE members were standard procedure. In 1973-74, some 40 MOVE members were arrested 150 times, fined approximately $15,000 and given sentences of up to several years in jail. In 1976, blackjack-wielding cops descended on a MOVE celebration, and in the resulting melee Janine Africa’s newborn infant was trampled to death. In 1978, then-District Attorney Edward Rendell declared that the police would have been “within their rights to have, subsequent to the shooting of Officer Ramp, stormed the house and killed all of the 12 people in the basement.” In August 1981, nine MOVE members including Delbert Africa were sentenced to prison terms of 30 to 100 years on false charges stemming from the death of Ramp. 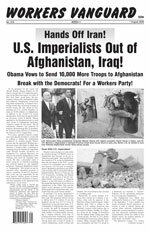 At the time, standing alone among journalists in defense of MOVE was Mumia Abu-Jamal, who is today America’s foremost class-war prisoner (see article, page 12). By the time of the 1978 assault, Mumia had already interviewed victims of police brutality and was acquiring a reputation as the “voice of the voiceless.” In December 1981, only months after the MOVE 9 conviction, Mumia himself was arrested on false charges of killing Officer Daniel Faulkner and sentenced to death explicitly for his political views. The D.A. Rendell, who prosecuted the MOVE 9 and Mumia Abu-Jamal, is Pennsylvania’s current governor and a leading player in the national Democratic Party. He is one of a number of leading figures in the Pennsylvania state government for whom the vendetta against MOVE and Mumia has played a key role in building their careers. Free Mumia now! On 13 May 1985, the MOVE prisoners watched in horror from their Pennsylvania cells as the Philadelphia police under black Democratic mayor Wilson Goode, in league with federal authorities, came to finish the job they had started in 1978, dropping a high-powered explosive bomb on MOVE’s Osage Avenue home. Eleven people, including five children, were burnt to death and an entire black neighborhood was left in smoldering ruins. This coordinated act of racist state murder must never be forgotten. In 1998, Merle Africa of the MOVE 9 died in prison, having spent nearly 20 years behind bars. Despite persistent persecution and repeated harassment, the MOVE members have remained strong and outspoken, steadfast fighters not only for their own freedom but also for the freedom of Mumia Abu-Jamal. This year, for the first time since their imprisonment 30 years ago, the eight surviving members of the MOVE 9 became eligible for parole, and already Debbie Africa, Janine Africa, Janet Africa, Eddie Africa, Phil Africa, Delbert Africa and Michael Africa have been turned down. Chuck Africa is eligible for a hearing later this year. It is an outrage that these men and women have spent a day in jail. They are innocent survivors of premeditated police assaults. For the immediate, unconditional release of all the MOVE prisoners! The sinister web of police surveillance, violence and frame-ups that succeeded in entrapping the MOVE 9 and Mumia Abu-Jamal is no aberration. Terrorizing the besieged black and Latino populations is precisely the job the cops are paid to do, and the courts enforce legal lynch rope “justice” in the service of the American racist capitalist exploiters. Like other urban centers, Philadelphia is a concentrated expression of racist American capitalism. The U.S. bourgeois order is rooted in the segregation of black people at the bottom of society, with the color bar serving to obscure and reinforce the irreconcilable class division between labor and capital. It will take a workers revolution to put the capitalist state’s machinery of torture and death out of business once and for all and to bring to justice the hired thugs of the capitalist class who have committed untold numbers of crimes against the working class and minorities.